Chronicle Books, San Francisco, 2016. 36 pages. 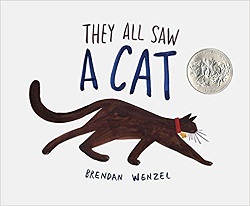 This picture book is a clever way to introduce children to the idea that other people – and creatures – have different perspectives. with its whiskers, ears, and paws . . .
Then we’re told that different creatures saw A CAT – beginning with a child, and then a dog, a fox, a fish, a mouse, a bee, a bird, a flea, and other things. But the pictures give us a fanciful image of how each creature sees the cat. The mouse, for example, sees a frightening and fierce monster. The fish sees something large staring through the walls of the fishbowl. The bee sees something multifaceted with its multifaceted eyes. And the flea sees a forest of fur. The language is simple and lilting, and the images are striking. But what’s absolutely brilliant is how much space it makes for conversation. This is a lovely book presenting an important idea: Not everyone sees the world the same way. Yet it expresses this idea in a way even a child can understand, while also provoking further thought. Brilliant!